The passive use of the goods provided by nature has always been present in the behavior of both humans and animals, from the most basic attitudes, as food gathering or seeking protection from predators or from weather in caves, even the most sophisticated forms of exploitation of local materials for construction, or natural forms of energy such as wind for sailing, water courses for mills, etc. Of these, construction activities resulted, thanks to the experience handed down from generation to generation, which, based on the popular architecture, will become passive architecture and evolved bioclimatic. Usually it is called passive conditioning systems to those that are a constituent part of the building, whether design factors or basic building elements (walls, windows, roofing, etc..) or modified (greenhouses, galleries, basements, etc. .) In this way the building becomes, naturally, in the collection system, control, regulation, accumulation and distribution of energy needed by its occupants to live. Bioclimatic architecture is an architecture adapted to the environment, an architecture that takes into account the visual impact and disruption it causes to nature, an architecture concerned about the pollution it generates, either solid (solid waste), liquid (water dirty) or gas (combustion gases of fossil fuels). This last aspect, the gaseous pollution, leads to a kind of design therefore seeks to reduce or eliminate energy dependence. These constructions exploit the full potential energy that gives the atmosphere of their surroundings, a fact which gives rise to the name of bio-climatic. It is therefore evident that one of the previous aspects to consider in any architectural design should be the climate of where you are placing the building. The climatic characteristics have always influenced both the choice of settlement in the shelter of man, as the arrangement, orientation and shape of buildings. Proper consideration of these qualities, and the choice of materials that conform to the best of the weather where you are going to build, will allow you get more comfortable indoor environment and reduce energy consumption for conditioning. The development of architectural techniques of conditioning, relatively low fuel costs and the idea of associating the level of life energy, combined with the latest architectural trends, resulted in an undifferentiated architecture, repetitive in any weather condition. The predominant use of curtain walls, or in any case, the soaring walls of glass, thus resulted in the energy waste involved in the chaos of these architectural elements in the packaging, under both winter and summer. The term ‘vernacular architecture’ is used to refer to traditional buildings that have been designed and built to match the local climate and culture. Much research has been carried out on vernacular architecture, but mostly from humanities or social science perspectives, and very little from an environmental engineering angle. Many vernacular housing environments employ passive technology that was developed for such purposes as safety, hygiene, health or comfort using the limited technical resources available in the days before modern technology existed. Such housing environments can be analyzed by taking on site measurements and using computer simulation. Another remarkable feature of vernacular architecture is the use of local building materials that makes such good use of passive energy that almost no extra energy is required to maintain the housing. In other words, vernacular architecture provides the local inhabitants with a comfortable living environment while at the same having minimum impact on the natural environment. BEEh is an indicator for assessing the environmental efficiency of a home in terms of the environmental quality and environmental load. It provides an indication of the environmental performance of buildings by rating them in five categories according to their BEEh value. Assessing the environmental performance of vernacular housing and comparing it with that of modern housing promises to offers new insights and possibilities for developing housing with lower environmental load and higher environmental quality. Results showed vernacular housing to be either equal to or superior to modern housing in terms of environmental efficiency when both environmental load and environmental quality are taken into account. So, can be demonstrated the outstanding environmental efficiency of vernacular architecture. Buildings really cannot conserve the energy they generate or they gain, but they can reduce the rate at which they lose it, which is the same goal. The buildings are large energy consumers, both for lighting, for the operation of equipment and systems. Of all is the hygrothermal conditioning which produces the largest energy consumption. Currently, the heating systems are the priority consumers, but we must not neglect the growing consumption of refrigeration. Energy consumption in the hygrothermal conditioning is due to the heat transfer between inside and outside the building through the walls that confine indoor environments. The transfer of heat and therefore energy consumption increases as outdoor climatic conditions become more extreme, and as the heat resistance of the perimeter walls is reduced. As we can see above, an enclosure with a 3.0-U loses energy three times faster than a 1.0, and this one twice as fast as a 0.5-U. That means that after a year the building with walls with a U of 3.0 consumes 6 times more energy than one with enclosures with 0.5-U. Through the glass holes it is produced the greatest heat exchanges in the building envelope. – The orientation of the glazing__South orientation (Northern Hemisphere) allows a perfect balance of deposits in winter and protection in summer, which makes it more desirable. Path of the sun in relation to the window. – The type of glass__The type of glass can reduce in 90% the solar uptake, but it doesn’t give the option of raising in winter. – Protection__They allow a flexible behavior of the window. – Ventilation__The air exchange losses currently account for approximately 50% of the total energy loss of the building and, therefore, 50% of heating consumed is invested in combat, it is therefore important to control. However, since it is essential to ventilate the premises, it is necessary to adjust the ventilation necessary to avoid both excessive vents, as deficit. A possible classification of passive strategies of energy capture is based on how you perform. Direct, if the power enters the building at the same time it influences on the outer casing, or delayed, if between the time when energy is received and in which is used there is a long period of time due to a prior accumulation. Since virtually the only source of natural heat outside the building is the solar radiation, the direct capture can be produced only through transparent elements to it, windows, skylights and other elements translucent. The direct recruitment problem is the absolute dependence of the daylight hours, which together with the uncontrolled accumulation process, which will occur on floors and walls, causing an uneven distribution of heat throughout the day. To solve these problems posed by the simple collection, new systems have been developed. These improvements focus primarily on the proper accumulation of energy that has passed through the glass, and adequate spatial and temporal distribution of that energy. Passive solar systems that act on these parameters are called greenhouse attached and Trombe wall. Both systems are very similar, making a much like energy function. Of these, the greenhouse provides the basic idea, to catch the energy from solar radiation to heat air mass, while the Trombe wall provides essentially the distribution of that heat up less space. The greenhouse attached as passive heating system behaves the same way that the Trombe wall. While openings in the wall separating the adjacent room remain the same, it can be a weak element which does not have accumulation functions, such as the largest area of floor is enough to transform solar energy into heat. This allows referred to as greenhouse attached to a double glazed gallery, a conventional terrace court or a distribution atrium. Design thinking in the summer conditions is much more difficult than for winter conditions, as there are no natural sources of cooling as an alternative to the sun. – Use of clear surfaces. – Rational use of isolation. – Shaded and hidden holes. How to act in relation to the windows is as always double: preventive, on one hand, to arrange them into the most appropriate orientations and, second, corrective, to protect them from unwanted solar gain. While a niche oriented east or west in July in Madrid can capture the 488 W/m2, a hole facing south, the same month only captures a maximum of 289 W/m2, and a north oriented 144 W/m2. These data should be sufficient to point out as the most favorable directions south and north, but if we add to the attraction in January to those same holes east-west, south and north are respectively 198, 380 and 70, no doubt the south is right along the whole year. Actions described above can halve the amount of heat entering a building designed just right, for what enters into another poorly conceived. Nevertheless, this amount of heat will cause overheating and, if not remedied, the indoor conditions will gradually worsen. Then is the time to implement measures to eliminate the overheating, which are as essential as preventive actions. These measures can be summarized in one word: ventilation. Ventilation is the method to replace indoor air superheated by outside air, although its temperature is elevated is always lower than the indoor environment, if it has remained closed. Most appropriated ventilation is cross ventilation through holes located on different fronts, it is not necessary that they are opposed. Two different facades are always exposed to different wind pressures and, therefore, there are differences in pressure between the holes located on these fronts, causing natural ventilation. The effective temperature is a parameter that measures the sensation of heat or cold that causes an environment. As is known, the warmth does not depend solely on temperature. When we wear a thick coat feel a heat that disappears the moment in which we remove it, although the temperature of the room does not change, this is the clothing. If we are forced to run to catch a bus or carry a very heavy package, we feel more heat than if we just sit, this is the activity. If we put in front of a fan, which simply moves the air in the room, you feel cooler due to the air velocity. If you’re on the beach under an umbrella feel less heat than when we are in the sun, this is radiation. These factors, with humidity and along with many other, determine the effective temperature, the warmth of a room or a space. The buried structures are fully formed by cold walls. The upper layers of soil are affected by daily changes, while those below are affected by annual variations. For example, 9 m depth is almost constant temperature all year round. Having one or more of the walls of the building in contact with any of these cold surfaces is obviously more favorable to him in contact with the outside environment and subjected to solar radiation. If the home is ventilated with air of the night and the construction is massive enough and facades have insulation on the outside, the walls will cool and maintain the temperature during most of the day. This causes a reduction in the sensation of heat 2 ï¿½C when compared with conventional hot wall. The effectiveness of evaporative cooling is very high, but also has major limitations: it requires a fairly dry environment and the water is sufficiently exposed to a stream of air. Traditionally used in warm-dry southern Spain and northern Africa, in Muslim architecture, water fountains, rills, fountains, ponds, vegetation, etc. One of the most promising approaches to sustainable architecture is the design of structures that benefit from the unique profile of their immediate environment. Whether its south-facing solar panels or strategically located wind turbines, maximum efficiency is achieved by making the best of a range of environmental factors. This dispatch from the future of skyscraper technology takes us to the northern coast of Chile, where Alberto Fernï¿½ndez and Susana Ortega have conceived of a Fog Tower that absorbs and channels water from its mist enshrouded environs. This pristine helical structure would allow for the development of a sustainable agriculture environment at the edge of the Atacama Desert, one of the driest places on earth. 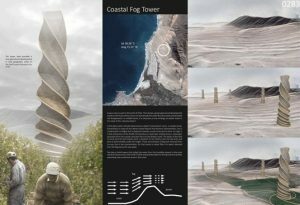 The Coastal Fog Tower is highly specialized in this approach, utilizing a type of fog unique to Chile called “camanchaca”. This dense variety of coastal fog has dynamic characteristics: stretching from Peru to the northern Chilean regions, it condenses into a low-lying coastal cloud layer (200-400m above ground) that pushes inland with the wind. Fog catching technology has already been deployed in some areas of Chile, providing a vital resource to communities that need it. The scale and distribution of these cloud castles could take this technology into the future – a seaside vista interspersed with these pristine helical towers would certainly be a sight to behold. The front surround is solved by a double skin, which is responsible for protecting the building. An inner skin of glass is the closing of each elliptical floor. A second skin, determined with glass fiber mesh white, wrap the whole. The outer casing can be transparent or opaque, let the air or not, depending on the finishes and coatings available. Each element of the facade was designed by its solar impact parameter, thereby opening or closing the web of fiberglass mesh can be reduced by up to 70% the incidence of sunlight on the facade. This will significantly reduce building energy consumption and increasing the level of environmental comfort, thus contributing to the overall sustainability of Justice Campus. The City eco-cybernetic takes input from the nature, its forms and strategies of integration with the environment. Its self-sufficiency is not only limited in the energy aspect, by the integration of aerogenerators that take advantage of the airflows between the two towers, and to the obtaining water of the air, but also in the economic, social and environmental aspects by its flexibility and integration of uses in the 150 floors, that turn it into a “alive machine”. This building integrate the communication networks, incorporating in its facade a system of photovoltaic lattices , that give energy to screens of led’s, creating a facade multimedia that interacts with the changes of the atmosphere. Also the skin of the building is made by bio-climatic panels who apply nanotechnology for their cleaning, these panels allows to the growth of vegetation in their surface creating a green mantle that purifies the air that crosses this skin.
" (...) the absolute necessity that, as global society, we are able to do more with less. That means that our buildings should not only consume less energy, but they must produce zero carbon and zero waste. Better yet, should collect more energy than they need to return it to the grid so that it can benefit everyone. "